I couldn't love permanent dermal fillings. As time passes, the risks and complications of permanent dermal fillers, which are newly or formerly produced, continue to be published. The photo above belongs to a patient who has consulted me from abroad. 8 years ago, "polyalkylimide" containing permanent dermal filler material with nose fill was made. Unfortunately, he had complaints of redness, discharge and discoloration on the nose, which started 3 years ago. Many permanent nasal fillers are much more likely to be new and more likely to have side effects compared to fillers with meltable hyaluronic acid. I shared these images with my patient's request and permission. 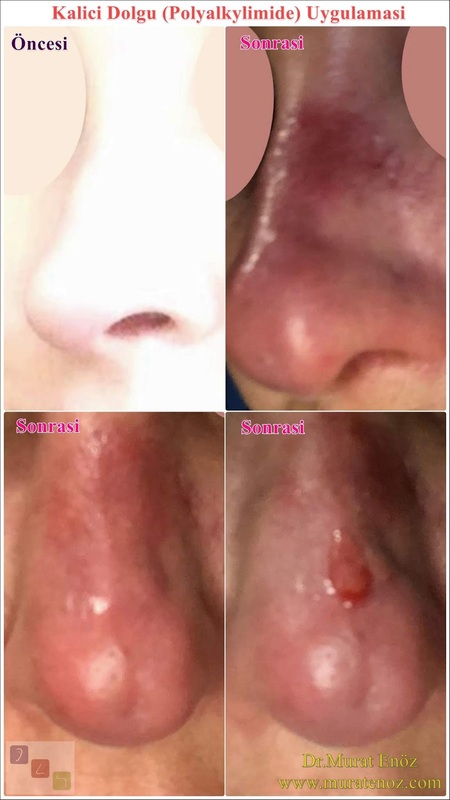 Especially in Germany, there are many patients who are seeking to find a solution in this matter and who are the victims of the reaction of these fillers. Unfortunately, there is no definitive treatment for these fillers, such as complete surgical removal or complete dissolution with a laser-like device. Cortisone drugs, antihistamine-containing allergy drugs, malaria drugs, antibiotics are the medical treatment tools called controversial. I am pleased to publish comments and comments of my patients who have experience on this subject and commented on the subject at the end of this link. Polyalkylimide is a polymer of the family of acryl derivatives. It is also the active ingredient in a permanent dermal filler called Bio-Alcamid. Polyalkylimide-based Bioalcamid was initially used as popular, but new and late side effects have been reported so far. The only main competitor in the foreign market is Aquamid, which has a long life in five years. Delayed granulomatous reactions have been attributed to collagen, silicone, polylactic acid, polyacrylamide, HA, porous polytetrafluoroethylene (GORE-TEX WL Gore & Associates Inc., Newark, Delaware) and methacrylate implants. There are also side effects of the same type. Methacrylated-collagen or ethyl-methacrylate-HA. are described by the use of combinations. Skin induction, nodules and pseudo-abscesses have been reported with polyalkylimide. Rare, delayed, moderate / severe immune-mediated side effects may sometimes occur with systemic symptoms depending on these fillings. Perhaps the use of more than 1 dermal filler source in predetermined hosts may increase the risk of delayed immune mediated reactions associated with bioimplants.